iQ-VIEW is an easy-to-use reading station that has been designed by radiologists for radiologists.The software is available in two different versions: BASIC and PRO. The BASIC version was developed as a reading station for all physicians, such as orthopedic surgeons, chiropractors, veterinarians and internal specialists, while iQ-VIEW PRO is optimized for radiology and nuclear medicine requirements. iQ-VIEW can be integrated into virtually any RIS, EMR or HIS available on today’s market. Additional modules for 3D post-processing, nuclear medicine, orthopedic templating, image stitching and more equip specialty readers with the required tools. iQ-VIEW is a fast and powerful reading station, which includes many additional useful features, such as a basic structured reporting module. It is also ideal for teleradiology purposes - encrypted DICOM email makes it possible. 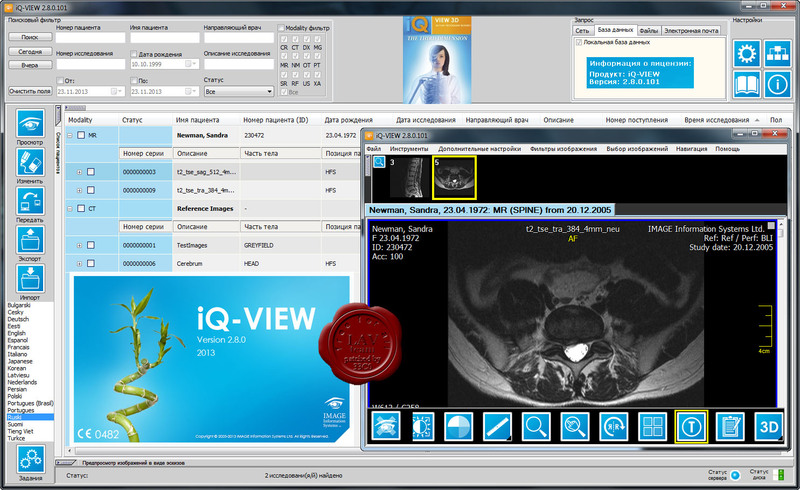 iQ-VIEW is the first viewer worldwide that has received the DICOM-CD certificate of the German Radiological Society. This guarantees that portable media created with iQ-VIEW fulfill the requirements for DICOM media and they can be used properly on any computer fulfilling the minimum requirements. iQ-VIEW 3D is an optional module, which turns iQ-VIEW / PRO into a full-featured 3D workstation for virtually all kinds of 3D image processing, e.g. for vascular, neuroradiological, traumatological, orthopaedic and cardiac imaging.